blend bananas, vanilla and milk together. combine wet ingredients with flour and soda. Bake 10 mins and then turn, and bake another 5-10 mins checking occasionally. Done when golden brown and tooth pick comes out clean. 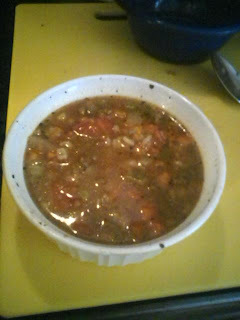 I have always LOVED vegetable barley soup... every time I am at a resturant and see it on the menu I know hands down that is what I am going to order... well I have been searching for a good recipe for awhile. It seemed that every time I tried one it would turn into a gloppy mess and just not look appealing... it always tasted ok, but in our house the people eat with their eyes first. A while back I blogged abut some amazing freezer meals that I had made with friends.... well the cheddar cheese meatloaf was LESS than a hit with my family. We have made this recipe several times and eaten it right away so the only thing I can think of is that the freezing some how made it less an likable for our family but lesson learned...won't be doing that again.